If you, like me, work in an office, chances are you spend at least 8 hours a day in the blasted thing. 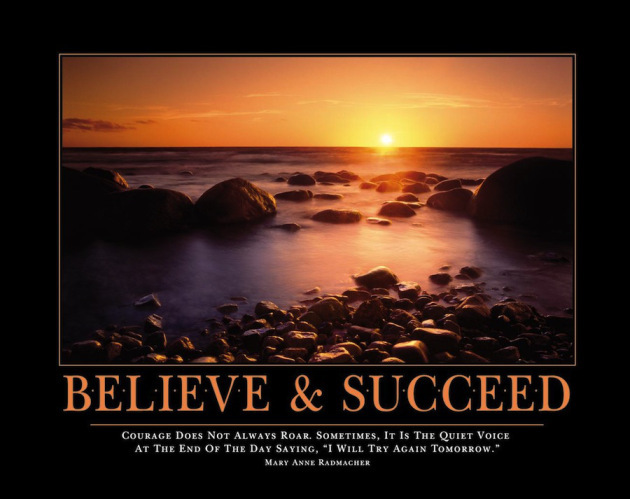 If you’re unlucky, that means you spend A LOT of time sitting at a cheap, MDF desk, looking at scuffed walls that are in desperate need of a repaint and are forced to look at those very irritating ‘motivational’ posters. which ironically are anything BUT. Actually, when I see those posters I usually have a strong desire to rip them off the wall, put them through the shredder and use the remnants to fill a parcel/light a fire/push into a pair of shoes that are too big. So when I was approached by London Offices asking if I’d be interested in entering their competition to design my dream office, how could I resist? Having the freedom to design your own office comes with many risks; for example I had to fight the urge to install a Nail Bar, Book store and a Subway outlet. I decided it was safer to just focus on the general design aesthetics. Therefore, the following office space has been designed if I, (Anita Brown Design Studio), occupied my very own premises. I’m officially a 3D Visualiser but I do have a keen interest and a little bit of training in Interior Design, so I would imagine that many Creative industries would have similar objectives as me when it comes to the design of their ideal office. It’s got be inspirational, a space that encourages creativity but also functions on a practical level. First and foremost, in my mind, a design studio by its very (creative) nature needs to have a space that fully conveys its ‘vibe’ and ensures that cutting edge design is high on the agenda. I’m a huge fan of industrial inspired design, alongside vintage injections, so it goes without saying that MY office would combine the two. I also think it’s very important that sustainability is given a mention in the overall design, so I’d ensure that selected pieces were upcycled. More about that later. Ok, enough rambling. Let’s look at my final design! You cannot have an industrial inspired space without the obligatory exposed brick wall, it’s impossible. So my ideal office will have exposed brick, large ‘warehouse’ style windows and a colour palette of pale grey (walls) and limited injections of yellow-green (or as the professionals call it ‘chartreuse’). I’m not a believer of using vibrant colours on walls in an office based environment. Yes, you want to inspire and motivate staff but I don’t think a distracting bright pink wall is going to do that. Plus, I like the understated and streamlined aesthetic of grey. It won’t date too quickly, is easy on the eye and will allow statement pieces/accent colours to shine. The flooring is a characterful and rustic wooden floor. 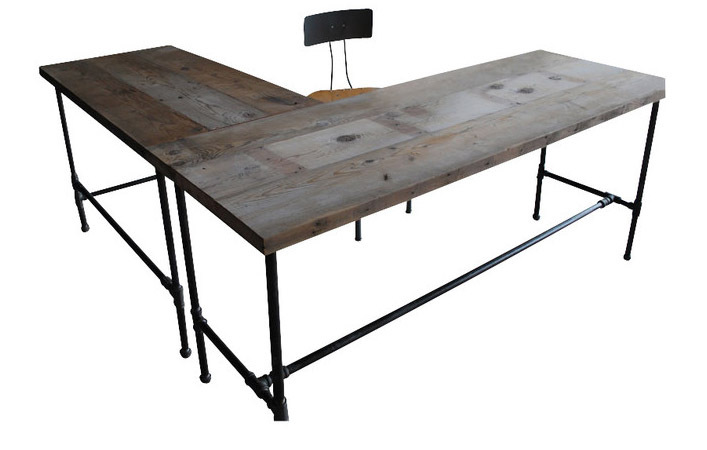 Wood is essential in an industrial inspired interior to add warmth and richness. My preference would be natural, untreated wooden planks. These could be salvaged and recycled, as a business it should be satisfying to know that you’ve given an old material new life and are also being environmentally aware. One of the most important purchases for an office are desks and I wanted these to be show-stoppers. I hunted for inspiration and FINALLY came across these beauties. Seriously, let’s pause for a moment and take in the charm, individuality and character of these little gems. 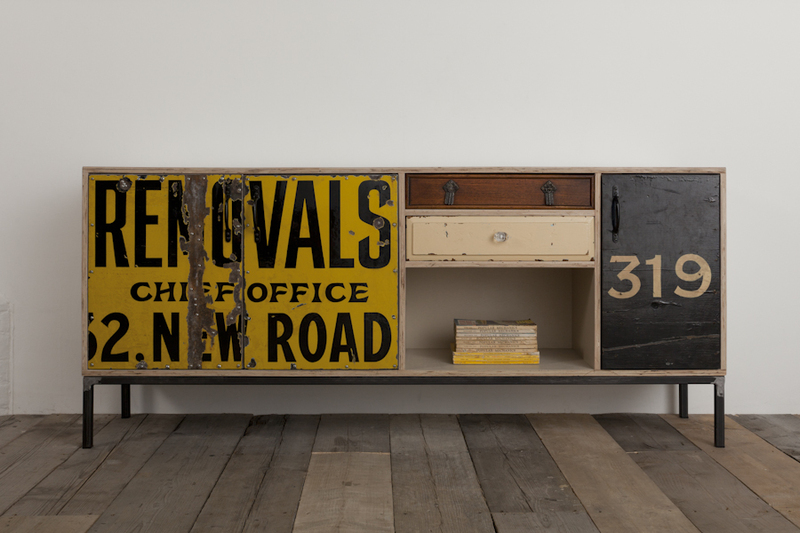 Available from Houzz, they have been crafted using reclaimed wood and pipe legs. Yes, PIPES! As a business, you want to make a lasting impression on clients and have conversation pieces. THIS. IS. IT. They’re also demonstrative of a business that places importance on sustainability – they are truly a fabulous illustration of what can be achieved by upcycling. AND they’re sooo industrial in design. Perfect for this space. To encourage collaborative working/social interaction I have suggested three desks grouped together. My preference would also be an open plan arrangement, urban styling of this nature always works better as open planned because it has much more impact due to the expanse of space afforded by ‘warehouse’ or ‘loft’ premises. It also ensures that natural daylight is maximised – and we all know how important natural daylight is for a harmonious, productive and healthy workforce. This brings me conveniently onto the subject of lighting. It’s important to have layered lighting, and that goes for all design schemes, not just an office space. You can’t see them in my 3D visual but trust me, there are ceiling spotlights in this office, acting as the main source of artificial lighting in this space (they also highlight specific areas, for example, the art, company name and whiteboard). Next up are the sublime vintage Teardrop hanging bulbs (I created 3D visuals of these for Grand Designs Live 2014, read more here). This form of lighting is purely decorative but my, oh my, they are a fine addition to an industrial and urban inspired space. They are uncomplicated, raw and understated. However they STILL demand attention. They are available at Rocket St. George. 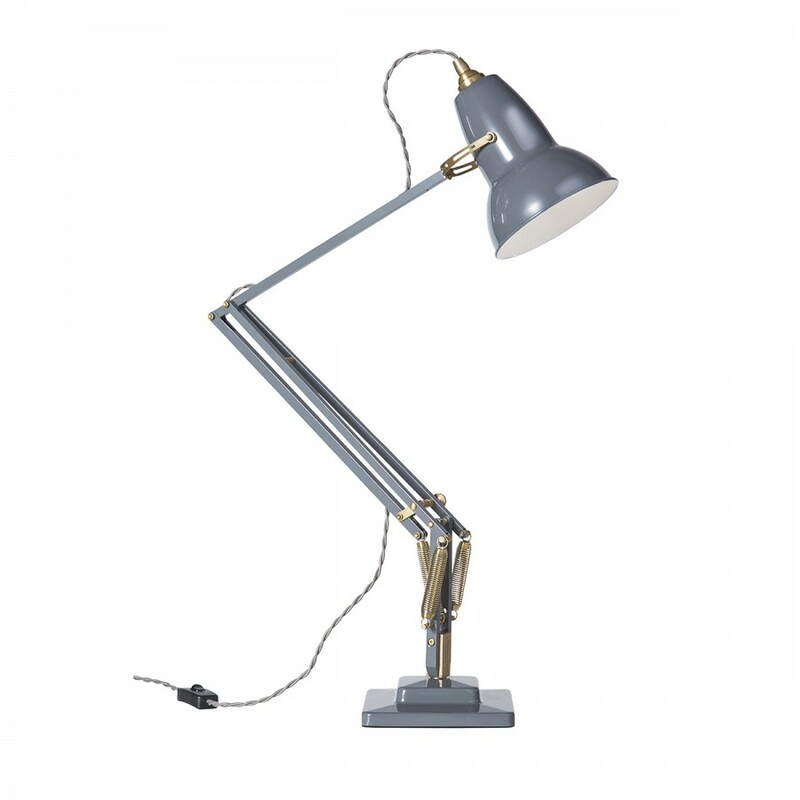 If there was one interiors item that I was fully willing to devote my unwavering adoration to, it’s the Anglepoise lamp. I have included these desk lamps on EVERY desk (I know, I’d be so popular in the office with this decision), technically they would be considered ‘task’ lighting and in a creative/design oriented office, task lighting would be considered a must. 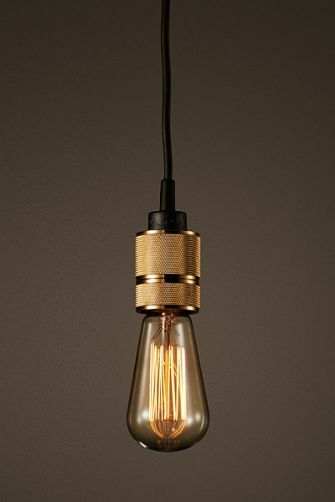 Design wise, these iconic lamps add a wonderful vintage injection that help to add character and ultimately helps to soften the harder edges of the industrial inspired elements in the space. I came across an awesome upcycled piece by Rupert Blanchard. He is the King of taking the discarded and transforming it into pieces of upcycled art. I was drawn to this particular item because of the metal sign (great at reinforcing industrial inspired design) and the mismatch of drawer fronts/handles. On paper it really shouldn’t work but in reality it’s uber cool! This is much more a statement piece than anything else but can obviously be used to store office paraphernalia too. Again, it illustrates the importance of sustainability in design. Its use of typography is also HUGELY on trend. Upcycling and urban design in general has been dominating the interior design scene for quite a few years and it’s important that a Design company illustrates its awareness of forward-thinking, cutting edge design. I have also suggested an open storage rack that’s much more practical and compliments the overall urban vibe. Clearly, there needs to be more dedicated storage for staff/client files and suitable filing cabinets could be sourced and located at the wall directly opposite the windows. With regards to zoning the space, I have opted for a dedicated ‘brainstorming’ area, at the rear of the office. This has been designed using a whiteboard (someone has written my website strapline on it, I’ve no idea how that happened…), with a wall mounted (old) plank of wood underneath and four brightly coloured Tolix stools. Sometimes it’s refreshing to engage with colleagues away from the desk, where ideas can be openly discussed and explored. 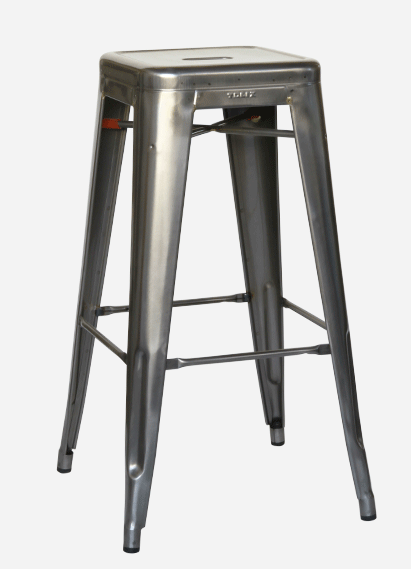 I have intentionally used Tolix stools with bright colours to add an element of fun and to provide relief from the more ‘serious’ industrial design elements in the room (brick, metal, distressed wood etc.). Whenever the word ‘industrial’ is uttered, Tolix is never far behind. That’s because the original Tolix chairs were designed circa 1930, they are made of galvanized steel and today they are instantly recognisable as an iconic piece of furniture that encompasses industrial design. Therefore, Tolix HAD to be incorporated into this design. End of. And I have one! It’s not original (because really, who can afford that?) although it is an authentic Tolix. Read my blog post for more Tolix related natter. I’m such a fan of vintage/iconic designs in a space , that I’ve created a very atmospheric/retro 3D visual of this space. Very moody, don’t you think? I’ve also included a staff break-out area where the fabulous yellow-green kitchen chair is located. For the purposes of the 3D visual, I didn’t include more chairs and a side table but they could be easily accommodated in this area. This would provide staff with the opportunity to take breaks away from their desk, socialise with colleagues or just simply have a cuppa. Oh, and these chairs are available at Habitat. Aren’t they cool! No one would expect to see a few kitchen chairs dotted around an office and I love the element of surprise in an interior. This is a great colour to pair with grey, the yellow-green helps to counterbalance the more ‘serious’ connotations associated with the grey hue. Lastly, there are a number of finishing touches/decorative elements that I have incorporated. The most important being the name of the company! ‘Anita Brown Design Studio’ has been engraved on wall mounted stone. In my eyes, this is a very understated but very chic design feature. The use of stone ties in with the urban theme and the subtle engraving has been designed to only be visible upon closer inspection. I like this feature. I like it a lot. For added drama, statement art has been positioned at either side of the above feature. I threw these pieces of ‘art’ together very quickly in Photoshop. They can’t be purchased. I did this intentionally because I wanted something ‘original’! The colours used also compliment the colour palette within the room. Cushions have been dotted around casually on the window ledge, upcycled sideboard and kitchen chair. I’m really drawn to the idea of having an office space convey a very casual design aesthetic: it isn’t fussy, contrived or unapproachable, plus this design fits so perfectly with the urban style. More typography has been incorporated with the wooden letter ‘A’ perched up against the window. These can be purchased at Not on the High Street. This is high on my ‘must have’ list but enough about me.